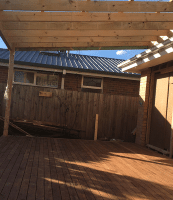 Whether you’re renovating an old, neglected backyard or undertaking the build of a brand new home, make the most of the space you have available with the help of AMG Quality Constructions. Structures such as carports, verandahs, decking and pergolas are an increasingly popular way to create a new outdoor area or transform any empty space. AMG pergolas and decking Ringwood will leave you with a much sought-after extended entertaining area or a beautiful place where you can sit back and relax in the comfort of your own home. You can trust the team at AMG Quality Constructions to deliver a structurally sound, visually appealing and cost-effective design. A sought-after feature of many homebuyers, a pergola adds a great deal of resale value to your home, providing a dramatic ‘facelift’ to the aesthetic appearance. For those who like to spend time outdoors relaxing or entertaining, pergolas act like an umbrella to provide weather protection while maintaining the feel of an outdoors atmosphere. Here at AMG, we can design and construct beautiful pergolas in Ringwood to complement your existing home and garden and making outdoor living a beautiful and private experience. The pergolas Ringwood specialists at AMG aim to take away the stress so that your pergola is built and you can enjoy it as soon as possible. In most cases, decking acts as the transition point between your house and the garden. It should be an inviting space that is easily accessible from both areas. If you’re seeking the warm appeal of wooden decking, we can build to your specifications. Here at AMG, we’re the decking Ringwood specialists. We only use the finest quality materials and qualified carpenters, so you can enjoy family time for years to come. We have a wealth of knowledge in designing and constructing the perfect decking and integrating a deck into the landscaping of your garden. Adding a deck by AMG to your home is adding value as well as a functional space for year-round use. If you’re looking to complete your garden or outdoor area with a beautiful pergola, decking, carport or verandah design, you’ve come to the right place. Our team is ready to transform your outdoor area and give you more living space, improved entertainment ideas or simply making your dream backyard makeover a reality. We’re local and know the environment and our expert advice will carefully match your requirements. No job is too small, and as fully licensed builders we can take care of the most demanding project. To find out more about our decking and pergolas Ringwood residents can speak to the AMG team by calling 0432 170 146.